Bitter Heritage by Margaret Pedler ~ 1928. This edition: Hodder and Stoughton, 1928. Hardcover. 316 pages. A hugely predictable melodrama about a young woman whose father has disgraced himself, and by association her, by a massive financial gamble with other people’s money which failed. His subsequent suicide makes things even worse. But not to worry! Herrick is a plucky young thing (and beautiful, which is useful) and she goes out into the cruel harsh world and makes a new life for herself. We see her next a very few years later in Paris, working as a model for a famous dressmaker. Herrick impresses all by her natural sweetness, including her money-minded employer (digression: are all Parisian dressmakers as deeply mercenary as vintage English novels make them out to be – think about that one, fellow readers – can you show me an exception? ), and in particular an English client, Lady Bridget, who – quelle coïncidence! – turns out to have been the long-ago romantic flame of Herrick’s father, and the possessor of a letter written to her by him just before he pulled the fatal trigger instructing Lady Bridget to look after his darling daughter. No, wait. That would be too easy. The son’s romantic feelings are engaged elsewhere, but he acts as a brother-like chum to Herrick, which comes in handy when she needs a masculine shoulder to cry on. As she does, because her life is soon complicated with not one but two impetuous would-be lovers. One being – all unknown, because Herrick and her sponsor are all being very cagey as to her familial origin – the son of a man who was ruined by Herrick’s father and who was only saved from disgracing himself by suicide by his sudden death by heart failure while written his goodbye letter, revolver on his desk. When this comes out, hasty words are spoken, and it looks as though Herrick’s “bitter heritage” will stand in the way of her future happiness. Another plot twist removes all obstacles. Shall I tell it? Or can you guess? You know, I’m going to leave it unrevealed. Just in case someone reading this with a view to reading Bitter Heritage wants a surprise. And with that, I leave you. And this book. Of “period piece” interest only, and forthwith shelved accordingly. 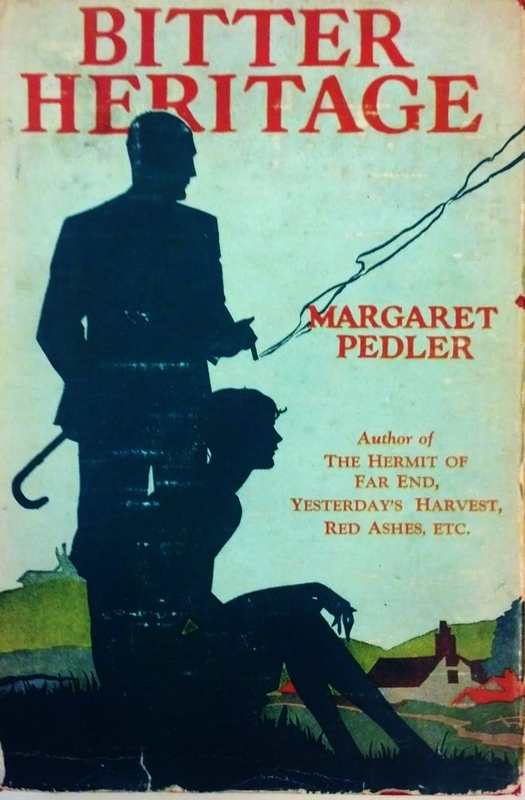 Margaret Pedler (died 28 December 1948) was a British novelist, who wrote popular works of romantic fiction. Initially Pedler studied piano and singing at the Royal Academy of Music, and published several songs for which she wrote both the music and lyrics. Over her career as a best-selling writer, from 1917 to 1947, she produced 28 novels. Wait, does “shelved accordingly” mean you’re keeping it? From what you’re saying it doesn’t sound like a keeper! Aha! You caught that! 😉 Meaning, close to the door, so it’s easy to box up when next doing a book purge. Though I must confess that doesn’t happen all that often. But no, not really a keeper, this one. Goodness, there’s a name I had almost blocked out. Margaret Pedlar. But I rummaged around in my memory and found her. Some years ago, I picked up “Red Ashes” at a garage sale and thought, Hmmm, 1920s novel…might be mildly amusing. It was not. Because it was far-from-mildly anti-Semitic. Written with the assumption the reader is on side with the writer’s and characters’ prejudices. It too was shelved accordingly. In my fireplace. Yes, the only book I ever burned. Because I couldn’t put it back into any kind of circulation. I hear you. Same response I had to reading Her Father’s Daughter by Gene Stratton-Porter. The most openly racist book I have ever encountered. Written post-WW I, a major plot point was the danger to the “inherently better white population” from “the Yellow Menace”. Or, just in case that isn’t clear enough, “the sneaky Japs”. I’m all about making allowances for era-expected political incorrectness, but this one crossed the line in the most emphatic, smug and hateful way.